Product #46894 | SKU FSA04101 | 0.0 (no ratings yet) Thanks for your rating! 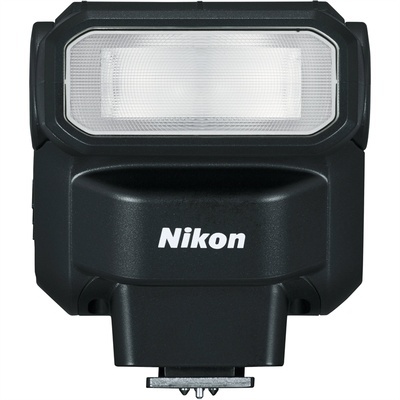 The Nikon SB-300 AF Speedlight is a lightweight on-camera flash that is compatible with Nikon cameras featuring i-TTL support. The SB-300 has a guide number of 17.98 m at ISO 100 and a coverage of a 27mm lens with FX-format cameras. This allows for a total coverage range of of 27-200mm. Additionally, the flash has a distance range of 2-66'. The SB-300 ensures proper exposure and colour balance with i-TTL metering. When used with cameras featuring Nikon's Creative Lighting System you can access advanced controls like rear-curtain sync and fill flash. Bouncing light off a ceiling or wall is made possible with a 120° tilting head. This provides soft, even light on your subject. For security during operation, the flash will click into position at 120°, 90°, 75°, 60°, and when facing directly ahead. The flash also offers slow, first and second curtain sync for more creative control over your light. Weighing only 3.4 oz, its compact design makes travelling with this flash easy. The SB-300 operates on two AAA batteries which will provide a recycle time between 3.5-30 seconds and it comes with the Nikon SS-DC1 Soft Case for storage.